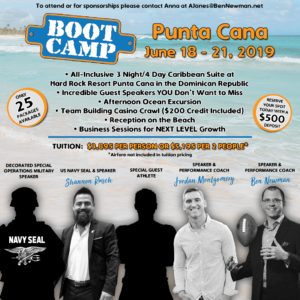 Don’t miss the once a year Boot Camp with Ben and special guests in Punta Cana. Boot Camp includes professional development sessions as well as incredible guest speakers, ocean excursions, beach reception, and a great team building event! You can’t miss this event! 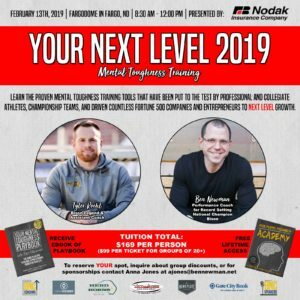 This LIVE EVENT with Tyler Roehl and Ben Newman is back by popular demand! Access their proven mental toughness training tools that have been put to the test by professional and collegiate athletes, championship teams, and driven countless fortune 500 companies and entrepreneurs to NEXT LEVEL GROWTH. Hosted at the Fargodome in 2019. This package includes everything Ben’s learned over years of trials and tribulations. 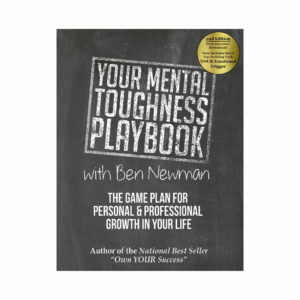 You get an up close look at WHAT mental toughness is, HOW you can build it, and HOW you can implement it in your life, every day! This playbook is about YOUR mental toughness and embracing the fact, that your success is not just about changing your habits it’s about changing the way that you think. This program has seen proven results with athletes in the NFL, PGA, and NCAA as well as Fortune 500 executives and top business professionals all over the world. Ben has shared his message in 7 countries, in front of hundreds of thousands of attendees and generated millions in speaking fees. This speaking course will give you insight to tips and proven techniques Ben has learned from his own speaking experiences and mentors along the way.